The two new locations of the DLC revealed. Bank levels are always a good idea. Just ask GTA 4, 5 or Deus Ex: Mankind Divided. 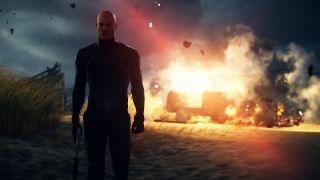 Today, as IO Interactive revealed the roadmap for its Hitman 2 content coming later this year, it revealed the two new locations coming to the game as part of the more expensive editions of the game: The Bank and The Resort. Gold edition players get both, while Silver edition owners get The Bank. Nothing more is said about them, but a bank level has to have an option to stage a heist, right? The Bank is scheduled to arrive this summer, while The Resort is arriving during the Fall. Also coming are freebies for all Hitman 2 players, including new themes for an existing in-game location. In the fall, meanwhile, a new prison-themed sniper map will be added to the game for Gold players. Free players get a new outfit, an antique knife, Ghost Mode for Mumbai, and a couple of new themes. For most players, I imagine the two new locations will be the centrepiece of all of this—I can't wait to see what IO has been up to since Hitman 2 launched last year. We named it our best stealth game of last year, and I think it's the game I played and enjoyed most last year, other than maybe Into the Breach.